ribbon-trimmed dress beginning with the Knot Dress Pattern from the blog, Me Sew Crazy, for the Sew-Along Pattern on Project Run and Play. Notice the box pleated lower skirt and the flat yoke on the top of the skirt. I substituted the flat yoke for the gathered skirt because I wanted the pleats to EXPLODE at the bottom. I used 4 different fabrics and 5 different woven ribbons. a floral polished cotton and patterned woven cottons. Most importantly... my Granddaughter loves it. 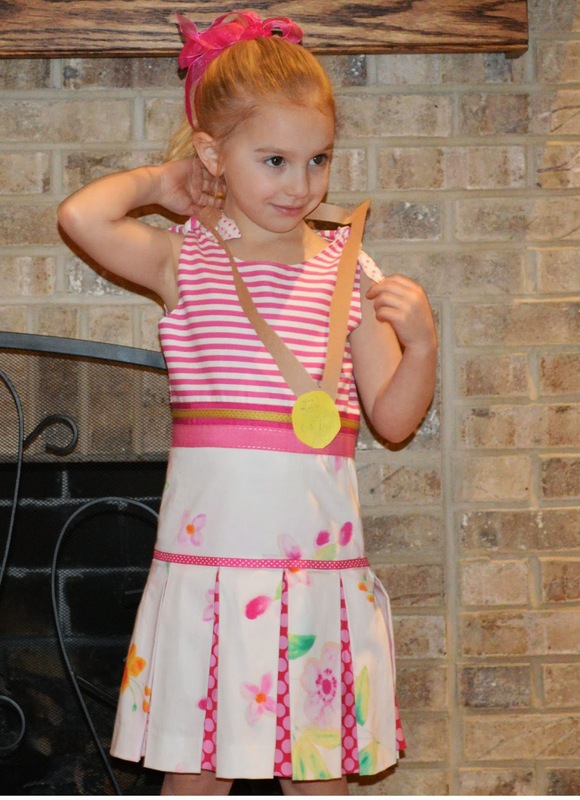 Her sister made her a construction paper medal that says, " You Win. U.S.A."
So bright and cheerful! What little girl wouldn't want to wear that? Very pretty. I love the bodice with the stripes and the polka dots, and the contrast fabric in the box pleats is perfect. I can spend hours in a fabric store just drooling over the fabric and putting combinations together. 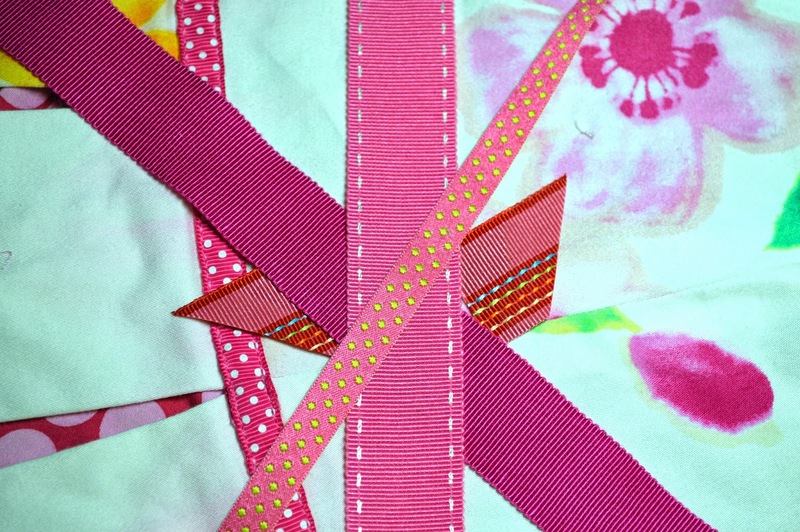 I'm head-over-heels when I plan ribbon and trim combinations. Thanks for your comment. This is just fantastic. I haven't started on getting my daughter's ready but a pleated skirt like this was something I'd been considering. It looks fabulous! Hi Deborah, what a great dress to welcome summer! I really love the pleated skirt. Wow! I love it! I have a cute potential-step-granddaughter-to-be who would also love something similar... time to measure her up methinks! The box pleats are ingenious and well constructed! Love it. WOW! Love the box pleats! You are taking it up a notch every time I look at your blog. This is gorgeous!!!! Thank you for linking it up at the SHARE IT sunday linky party.